J.T. Miller rolled up his gym shorts, twisted around, and tried to check out a rising red welt on the back of his thigh. He showed it off to his buddy Chris Kreider. “I’ve got one too,” Kreider said. Across the locker room, Kevin Hayes, dried blood still on his lip, described his game-tying score. 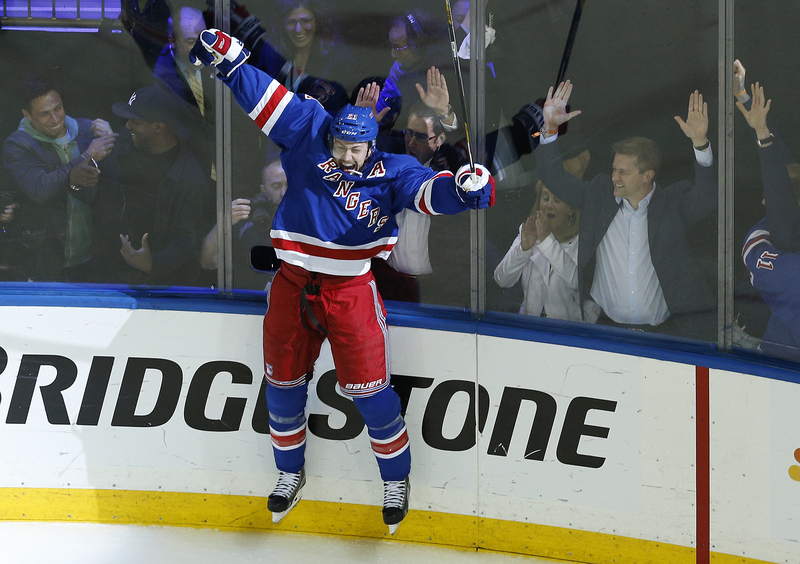 “A goal’s a goal,” he said several times, either at a loss for words or simply too tired, after the Rangers’ 2-1 Game 7 overtime win over the Washington Capitals, to be creative with them. A crowded scrum around Henrik Lundqvist finally dissipated, with a handful of smiling Swedish media lingering. When they wandered away, a lucky kid who’d been hanging around the locker room came and stood next to Lundqvist, his body about the same size as one of the Rangers goalie’s leg pads. Shy and awestruck, he made what had to have been one of the tougher inquiries of the night. “Were you ready when they scored?” His little voice made the question an actual chirp. It seems impossible that anyone could ever really be ready for the razor’s-edge uncertainty and fist-gnawing tension of an overtime Game 7, one of the wildest scenarios in the wide world of sports. Yet when it came to this Rangers-Capitals series, it felt as though everyone had secretly been preparing for this to go down for the better part of two weeks. This was the fifth time the two teams had met in the playoffs in the past seven seasons, and the fourth time the series extended to seven games. And this year, all seven — from the Capitals’ last-microsecond winner in Game 1, to the Rangers’ from-the-dead comeback in Game 5, to Sunday night’s gangbusters 4-3 game — were decided by just one goal. Never mind that the Capitals had at one point led the series three games to one before losing three straight. Overtime in Game 7 was the only plausible way this could end. With two off days between Games 6 and 7, there was plenty of time for the spotlight to land on each team’s finest player, tracking their every comment, describing their every stretch. For the Rangers, the focus was on Lundqvist, the once-in-a-generation goaltender who returned in late March from a two-month absence after being nailed in the throat with a puck and hardly looked any worse for the wear. While he gave up three goals in Game 6, he also made some of the biggest stops of the season to hold off a frenzied Washington team, and his performance in prior Game 7s was fit for a king. Madison Square Garden reacted with such swallowing silence to the 1-0 deficit that Ovechkin’s barbaric yawps were just about all that could be heard on TV. During Friday night’s Game 5, the Garden crowd had been so nervous and silent as it faced the prospect of elimination that after the game, Rangers radio analyst (and former blue-jeaned Blueshirt) Dave Maloney took it upon himself to implore everyone to put some pep in their step for Game 7. For all the mystique ascribed to the “World’s Most Famous Arena,” its fans — particularly the high-paying ones who populate the place during the playoffs — are sometimes as roundly flat as the Garden’s iconic roof. Much of it is a supply-and-demand issue: The folks who can afford the skyscraper-high StubHub prices sometimes act like the absentee tenants of fancy midtown high-rises: They’re there to see and be seen, but not always to fully engage.1 And when they do, they can get real antsy, real fast. Last night, though, it was hard to blame the natives for getting restless, as the Rangers, down a goal, neglected to take advantage of a series of three second-period power plays. With about 10 ticks left on the second of back-to-back penalties to Capitals defenseman Mike Green and fans making their frustration felt, Miller dished a beautiful diagonal pass to an open Hayes on the left side. Hayes tipped the puck past Braden Holtby’s outstretched pad to tie the game 1-1. Later, as the two teams came out for the third period, the MSG speakers blared “Right Now.” Don’t wanna wait till tomorrow/ Why put it off another day? But this was Rangers-Capitals, and any outcome would have to wait at least another period. After a scoreless third, everyone got what they had to have known would be coming: sudden-death overtime, the Capitals seeking to outrun their recent history and the Rangers looking to repeat theirs.3 Winner moves on. Loser goes home. Next goal wins. Good on good. As the two teams retreated to the locker rooms, it was hard not to think about those Van Halen lyrics. At the Capitals practice on Tuesday, Joel Ward got into a compelling and borderline existential discussion with Washington Post columnist Dan Steinberg about the folly of trying to extrapolate meaning from a sport so defined by near misses, tiny fractions, greasy slips, and lucky bounces. The Rangers, who ended their season in overtime to the Devils in the Eastern Conference final in 2012 and lost in the Stanley Cup final last year to the Kings in a double-OT game, seem to have internalized this concept themselves. It’s why they remained confident even after falling behind 3-1 in the series: They knew every game had been oh-so-close, that the score was more a function of luck than a referendum on skill. In the first few minutes of overtime, it was mostly the Capitals erupting. The line of Ward, Evgeny Kuznetsov, and Jason Chimera put enormous pressure on Lundqvist and the Rangers’ scrambling defensemen; that they didn’t manage to end the game and the series right there seemed to prove Ward’s earlier point. Instead, a routine faceoff in the Rangers’ offensive zone following a Capitals icing midway through the overtime period was what ultimately finished the night. A shot from the point by Dan Girardi ricocheted directly to Derek Stepan, positioned almost exactly where Hayes had been in the second period, and Stepan calmly gathered the fortuitously placed puck, took the shot, and won the game. Keith Yandle didn’t even see it go in. The towel-waving euphoria from the tense Garden crowd told him everything he needed to know. Ovechkin, stone-faced on the bench, silently unstrapped his helmet. Henrik Lundqvist sprinted up the ice so quickly he nearly tripped.4 For the Capitals, it was one more brutal loss in a long series of them, no matter how hard Trotz insisted that this time was different, that defeat should be “not your undertaker, it should be your teacher.” The Rangers, meanwhile, will now face the Tampa Bay Lightning — a.k.a. Rangers South, given the number of guys on the roster who came from New York. It will be a matchup between two young, speedy, up-and-down teams, one of them trying to return to the Stanley Cup final for the first time since winning it in 2004 and the other hoping to make up for a five-game loss just last season. In the Rangers locker room, above all the bumps and bruises and smiles and sweat, hangs a blank silhouette of the Stanley Cup. After each win, a player tacks up one-sixteenth of the puzzle. Last night, the big broad base of the trophy was complete. That’s only the half of it, though. The cup itself — the part from which everyone longs to sip — remains blank, an empty vessel still waiting to be filled. While just about everyone who attended Game 6 at the Verizon Center was rockin’ the red, MSG’s dominant color scheme never approached true blue — it’s more a mosaic of baby blue dress shirts and dark gray suit jackets. Between Miller, Hayes, and Kreider — who tied Game 5 and scored twice in Game 6 — the Rangers’ youth helped carry them through this series. Perhaps most underrated was the play of 23-year-old Jesper Fast, who excelled in the faceoff circle and was frequently put on the ice to help neutralize Ovechkin. Last season, New York came back from a 3-1 series deficit to the Pittsburgh Penguins. Speaking of Lundqvist, there’s clearly some Illuminati biz going on. Is Jay Z a Rangers fan?